180-gram 7LP + 4CD + DVD, book and extras in new box set! 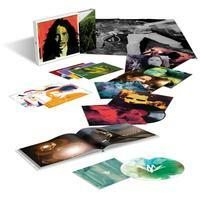 The Chris Cornell Estate presents a retrospective Cornell limited-edition box set commemorating the rock icon. The release follows Cornell's unexpected death in 2017, a loss that reverberated through the music industry far beyond the borders of Seattle. The limited edition Super Deluxe Edition 4CD, DVD, and audiophile 180-gram 7LP box set holds 88 tracks — 64 songs plus 24 videos, with 13 recordings previously unreleased overall — from all stages of Chris' career including Soundgarden, Temple of the Dog, Audioslave and his solo works. The package includes the 66-page hardcover photo book wrapped in linen with red foil signature, three artist lithos, three photochromatic lithos inspired by Cornell's lyrical fascination about the sun, a vinyl turntable mat, a microfiber vinyl cleaning cloth, liner notes, and a 36x48-inch wall poster. "Since Chris' sudden passing I have put all my efforts and energy into sharing his music and legacy with his fans from all over the world," said the late songwriter's wife, Vicky Cornell, in a statement. "I felt we needed to create a special collection to represent all of him - the friend, husband and father, the risk taker and innovator, the poet and artist. His soaring vocals found their way into the hearts and souls of so many. His voice was his vision and his words were his peace." The unreleased tracks included in the box set range from Cornell's duet with daughter Toni Cornell on Bob Marley's "Redemption Song" to his arrangement of "One," in which he layers the Metallica lyrics over the U2 track's instrumental. Live tracks from Temple of the Dog's 25th anniversary reunion (which was also their first official tour as a band) in 2016, as well as a few of Cornell's first solo live performances, are also included. As far as video content is concerned, the box set will feature two unreleased music videos, one for solo track "Scream" and one for Soundgarden's "Live To Rise."